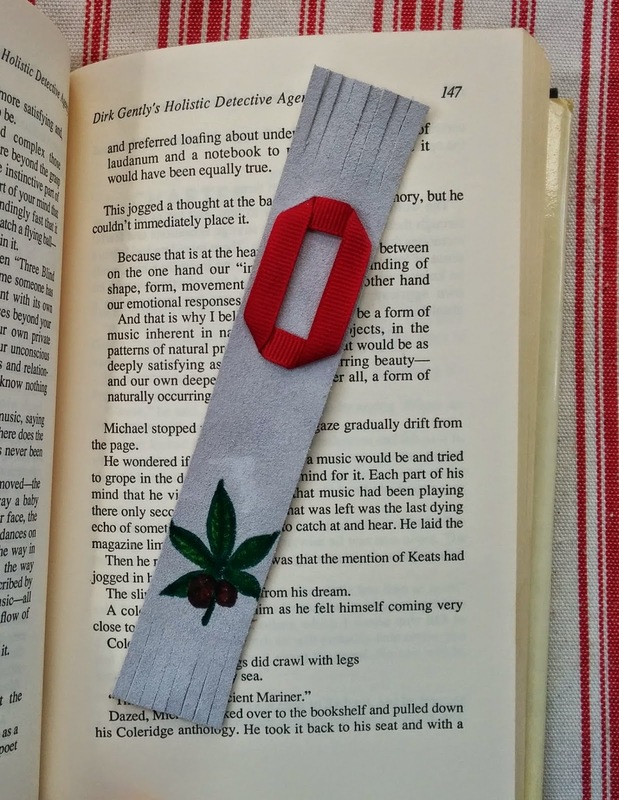 Susie Qute: Leather & Ribbon Bookmarks: Go Bucks! Around here college football isn't just a past time, it's a religion. There are special clothes, a catechism, a call and response, etc. When I first met someone from Columbus, I couldn't understand why most of his clothes bore a logo from The Ohio State University (don't forget the The!). After moving to Ohio many years ago, I was still blissfully unaware of the phenomenon for several months. Then I was working on a Game Day. Wearing the OSU colors goes far beyond a T-shirt or jersey on alumni. Fans love necklaces and bracelets made out of buckeyes, the large nut of the state tree. People of all ages stick temporary tattoos on their cheeks, or have an O painted on. Babies, kids, cars, dogs; 75% of the town seemed to have Buckeye Fever. Once I became aware, I noticed the region turns into a sea of scarlet and gray. Fans spill out onto High Street from the restaurants and sports bars. If the Bucks lose, there's a pervasive air of dejection the following day, especially if it was to long time rival, Michigan. Don't believe me? Attend any event, even if not sports related, in Central Ohio, and yell out "O-H!" You're guaranteed a response of "I-O!" Or just give a shout out of "Go Bucks!" when you see a someone in Buckeye apparel. They'll love you for it, even if you're a reluctant Buckeye like me. 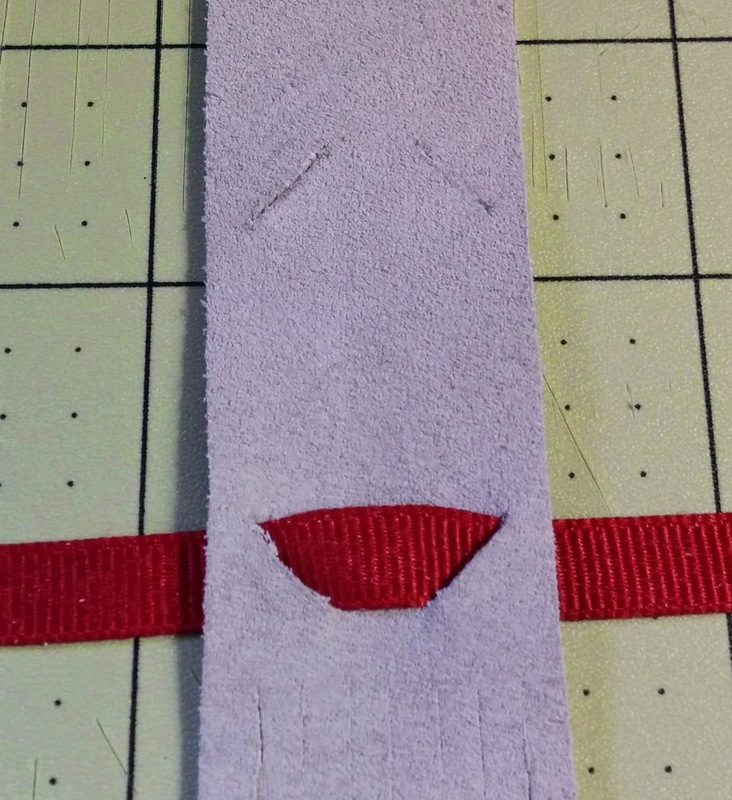 Cut a 1" fringe on either end of your bookmark. Start with the middle cut, then cut in the middle of each half, then in the middle of each quarter so you have eight even fringes. 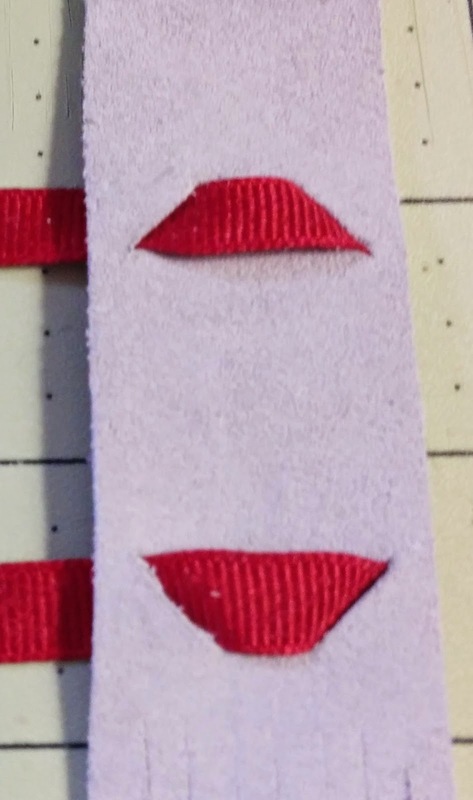 Cut four 45 degree angle slits slightly wider than your ribbon, about 1" apart, as shown at right. 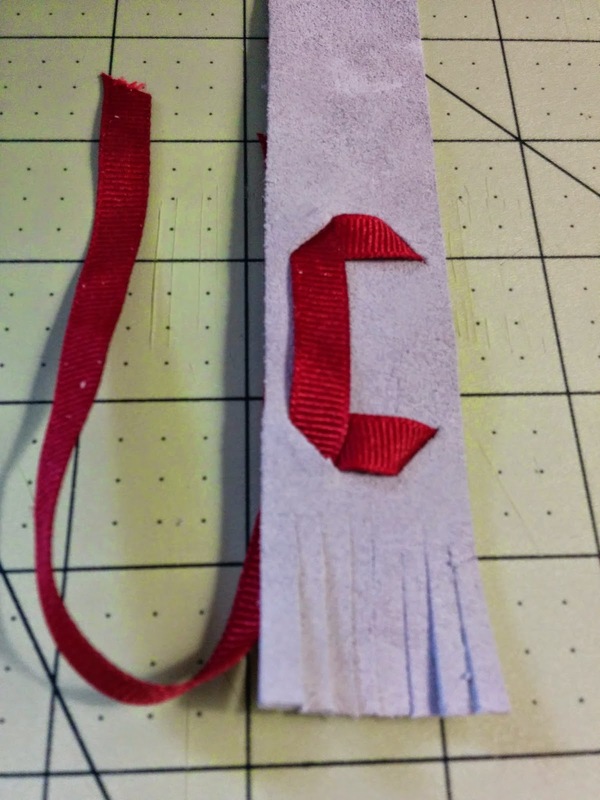 Thread your ribbon through lower two horizontal slits, coming up from the back to the front, then returning to the back. 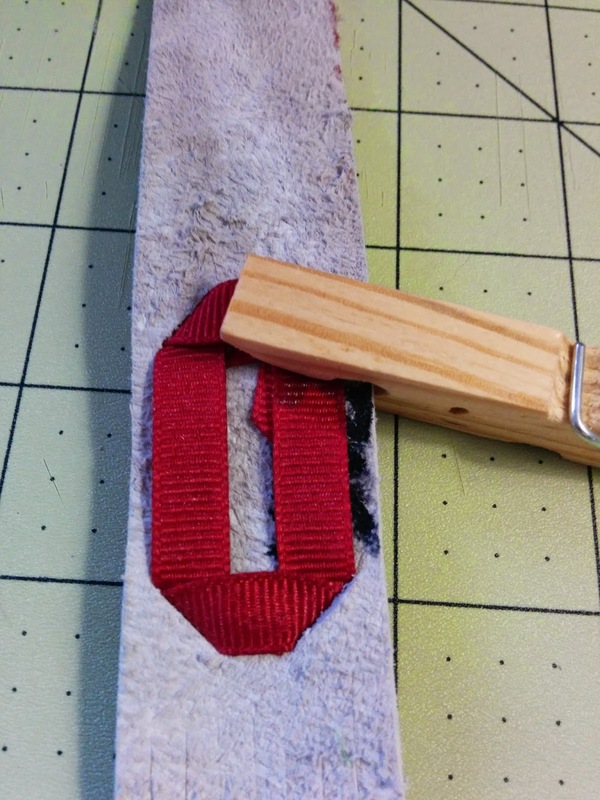 Turn to the back, fold the longer end of the ribbon up to the top slits, and push through to the front. Push end through remaining slit towards the back. Trim the ribbon ends. To keep them from fraying, apply a small amount of Fray Check, Super Glue, or my favorite for synthetics: just apply a bit of heat from a match or lighter (practice this first on a scrap so your project doesn't go up in smoke!). 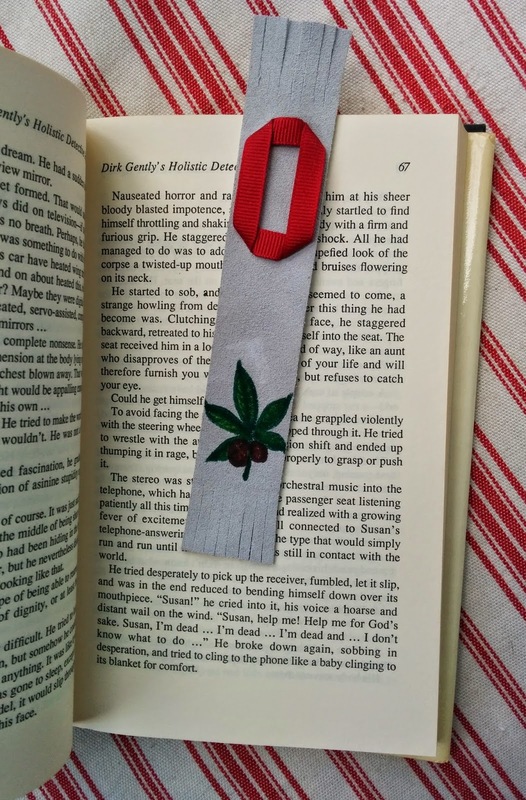 Turn bookmark 90 degrees and repeat to form the sides of the O. Trim ends and prevent fraying as described in step 5. Apply a few drops of super glue or take a few stitches with a thread and needle to hold all the ends down. I use a clothespin to hold the ends down while the glue sets-be careful not to glue the clothespin to your bookmark, though. I decided to use my Sharpies to add a buckeye leaf and nut. You can draw freehand, or try a rubber stamp. After the marker and glue dried, I pressed my bookmark under some heavy books to flatten the ribbon a bit more. You could use an iron set to low, but be sure to test it on scraps first. This could easily be adapted to make other letters, so be sure to post a link to your projects in the comments. Go Bucks!